1. String one crimp bead and one loop of the oval side of the toggle clasp on one length of the Buddy Braids about a ½” from the end. 2. String the Buddy Braids back through the crimp bead and squeeze the crimp bead closed. Do not trim the excess; simply string the beads on both ends of the Buddy Braids. 3. String another crimp bead and the other loop of the oval side of the toggle clasp to the other length of Buddy Braids about ½” from the end. 4. String the Buddy Braids back through the crimp bead and squeeze the crimp bead closed. Do not trim the excess; simply string the beads on both ends of the Buddy Braids. 5. Thread 1 - Crystal AB 4mm Crystal Round, 1 - Gold-Plated 3x2mm Rondelle, 1 - Crystal AB 8x5mm Crystal Rondelle, 1 - Gold-Plated 3x2mm Rondelle, and 1 - Crystal AB 4mm Crystal Round to one length of the Buddy Braids. 6. Thread 1 - Crystal AB 4mm Crystal Round, 1 - Gold-Plated 3x2mm Rondelle, and 1 - Crystal AB 4mm Crystal Round to the other length of the Buddy Braids. 7. 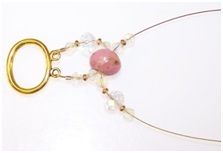 Take ONE end of the Buddy Braids and add 1 - Rhodonite 12x8mm Semiprecious Rondelle. Take the other end of the Buddy Braids and thread it through the other side of the same bead. 8. Pull the Buddy Braids snug. 9. Take the length of Buddy Braids that has the 1 - Crystal AB 4mm Crystal Round, 1 - Gold-Plated 3x2mm Rondelle, and 1 - Crystal AB 4mm Crystal Round and thread 1 - Crystal AB 4mm Crystal Round, 1 - Gold-Plated 3x2mm Rondelle, and 1 - Crystal AB 4mm Crystal Round. Take the other length and thread 1 - Crystal AB 4mm Crystal Round, 1 - Gold-Plated 3x2mm Rondelle, 1 - Crystal AB 8x5mm Crystal Rondelle, 1 - Gold-Plated 3x2mm Rondelle, and 1 - Crystal AB 4mm Crystal Round. 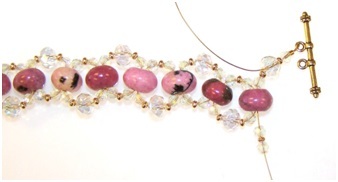 You will be alternating the pattern on each side of the Rhodonite 12x8mm Semiprecious Rondelle creating a wave. 10. 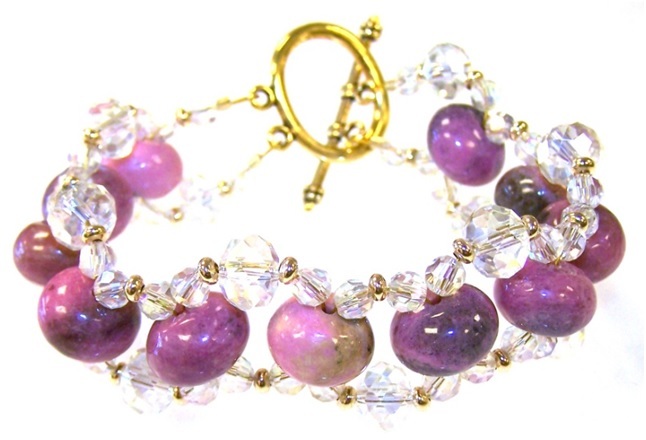 Take ONE end of the Buddy Braids and add 1 – the Rhodonite 12x8mm Semiprecious Rondelle. Take the other end of the Buddy Braids and thread it through the other side of the same bead. Pull the Buddy Braids snug. 11. Repeat Steps 9 and 10 nine times. This will make a bracelet that is 8 inches long. For a 7 inch bracelet repeat the step eight times. 12. Take the length of Buddy Braids that has the 1 - Crystal AB 4mm Crystal Round, 1 - Gold-Plated 3x2mm Rondelle, and 1 - Crystal AB 4mm Crystal Round and thread 1 - Crystal AB 4mm Crystal Round, 1 - Gold-Plated 3x2mm Rondelle, and 1 - Crystal AB 4mm Crystal Round. Take the other length and thread 1 - Crystal AB 4mm Crystal Round, 1 - Gold-Plated 3x2mm Rondelle, 1 - Crystal AB 8x5mm Crystal Rondelle, 1 - Gold-Plated 3x2mm Rondelle, and 1 - Crystal AB 4mm Crystal Round. 13. Take one length of Buddy Braids and add one crimp tube. Thread that length of Buddy Braids through one loop of the bar side of the toggle clasp. String the Buddy Braids back through the crimp tube and several of the last beads you added. Pull the Buddy Braids tight making sure all the beads are snug. See below. While holding the Buddy Braids use your pliers and squeeze the crimp bead so the Buddy Braids will not pull out. Trim the excess Buddy Braids as close to the beads as you can. 14. Repeat Step 13 for the other length of Buddy Braids.